Happy NEW YEAR!!! 2011 is your YEAR. It’s a fresh start… Believe in yourself and what makes your heart sing. Work hard, be patient, and the rest will take care of itself. May your 2011 be AMAZING. * PLAYList of The Year! The VOTES are in! The PLAYList of The YEAR Event at Greenwich was a Smash-Hit Success! Drum Roooollll please, the number 1 voted song of 2010….. Only Girl in World – Rihanna. It was a close call between P!nk and Rihanna but in the end Rih-Rih proved Victorious by a 2 Vote Margin. Come to SPIN and Sweat it out to the Top Voted Songs of 2010… The New Year is here; it’s time to get in the game. * NEWS – TV, Online, & MORE! 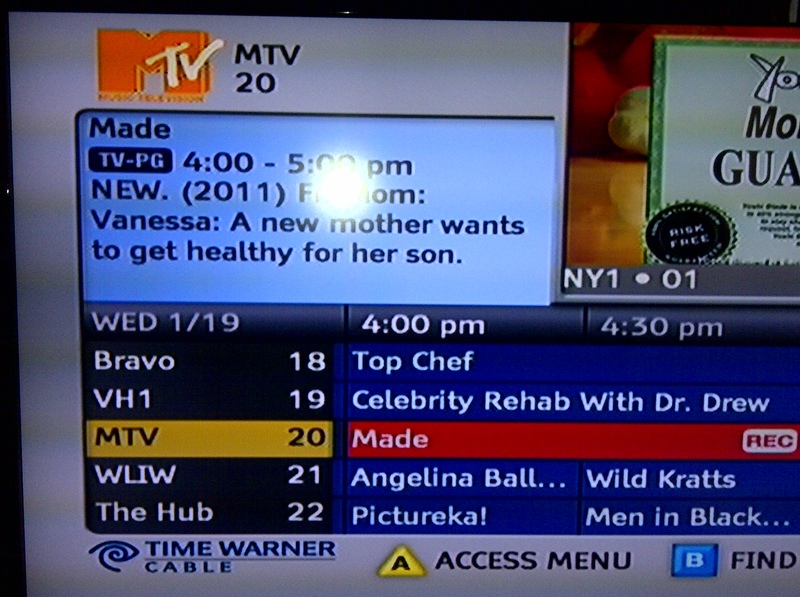 TV- MTV AIR-DATE – My Super STARING Appearance on MADE is airing Wednesday January 19th at 4pm. The show’s Title is Fit Mom and the airdate is subject to change so stay tuned to me on facebook and Twitter @laceystonefit, ok? 🙂 This is going to be a verrryyyyy special show! I’m so proud of everyone that took part in the production! Thank you Vanessa, Anne, and Elyse! THEBIGGAME! – TheBigGAME! is back on Friday mornings but it’s just a little later this year. Instead of 6.30am, I’ll be bringing it at 6.45am! Can’t wait. 2011 is underway… We’re already 10 days in. Have you thought about what you want to accomplish this year? Have you written it down? Every year I take some time at the beginning of January to access where I’d like to be by the end of the year. Last year I was all about accomplishment… I signed with Gatorade, I did two shows with MTV, I auditioned and became a finalist for NBC’s The Biggest Loser, and I got married… It was a whirlwind of Amazingness. Accomplishment and Success are AWESOME but only if it’s in balance with your soul. I encourage you take some time this month to access your past year. Did it Rock? Are there some things you could tweak this year to make it even better? Are there any changes you could make in your daily ritual that would have a positive impact on your life? Would going to the gym on a regular basis do that, reading more regularly, taking more time to relax? Take a moment this month to access not only what’s on your mind but also what’s in your heart. Really think about what makes you happy. Then commit yourself to living a life you’re proud of. Not because other people think it’s cool but because it makes you smile from the inside out. If something in your life isn’t working you have the power to Change… The New Year is the perfect opportunity to do that. I know change can be hard but sometimes changing what you once thought was “the only way” is The Way to your destiny. 2011 is going to be a groundbreaking year… Dare to dream, work for the luck, and never give up on what makes your heart smile. My schedule remains the same for 2011 except for two minor changes. Friday Morning TheBigGAME! is back but it’s moved a little later, instead of 6.30am it’s 6.45am. 6.15am – Spin – Greenwich – NEW TIME! 6.45am – TheBigGAME! – Greenwich – NEW TIME! I’m here almost the entire Month! WOOOOO!!! It gets cold in our fair city so I’m going to make a little trip south of the border at the end of the month. Other than that I plan on Bringing it Full-Throttle in every 45min Sweat-Fest we share… Are you ready to start this year off right people? It’s the time of year that people start thinking about getting a trainer. I’ve been working as a Top Trainer in the City for many years and I’ve made it a priority to get to know and build strong relationships with OUTSTANDING Fitness professionals. If you’re looking to make a change but don’t know who to work with OR even where to start email me. Let me know what you’re looking for and I’ll help guide you. I know loads of great trainers and nutritionists, and who knows if our schedules mesh we could possibly train together?! My mission is to help, as many people as possible feel good about their bodies and their lives. It would be my pleasure to help you Lacey@laceystonefitness.com.